PAN (Permanent Account Number) is an identification number assigned to all taxpayers in India. Why do you need PAN? PAN is an electronic system through which, all tax related information for a person/company is recorded against a single PAN number. This acts as the primary key for storage of information and is shared across the country. Hence no two tax paying entities can have the same PAN. 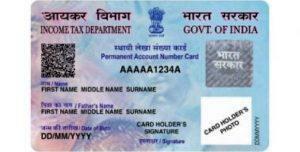 PAN Card is issued to individuals, companies, non-resident Indians or anyone who pays taxes in India. Firms/ Partnership (LLP) Certificate of Registration issued by the Registrar of Firms/ Limited Liability Partnerships and Partnership Deed. Trust Copy of Trust Deed or a copy of the Certificate of Registration Number issued by a Charity Commissioner. The cost of PAN card is Rs. 110 or Rs. 1,020 (approximately) if PAN card is to be dispatched outside India. Fill the form with your details. PAN will be dispatched within 15 days. How to Update/Edit PAN Details? A copy of (POI/POA) supporting documents are required. If you have lost your PAN card, not to worry. 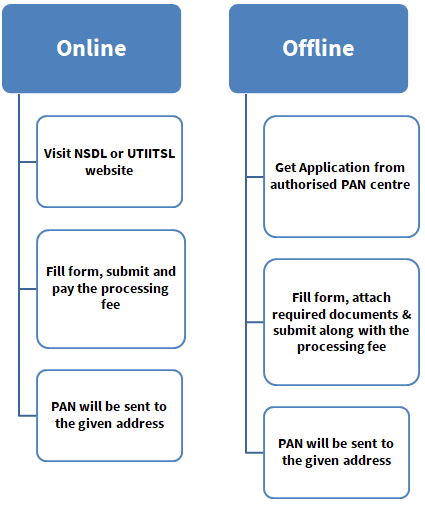 Apply for a duplicate PAN card online or offline. Login on to NSDL or UTIITSL website, Fill the form 49-A for Indian citizen or Form 49-AA in case of a foreigner and make the payment online for a duplicate copy of your PAN card. The PAN will be dispatched within 45 days. How long is the PAN card valid? The PAN is valid for lifetime. Can PAN card be made online? Fill the form 49A or 49AA for (Indian/Foreigner) with your details. The Income Tax Business Application (ITBA) has now enabled tracking facility for transactions made with PAN for calculation of tax purposes. PAN card contains information such as an identity, age proof and also complies with the Know Your Customer (KYC) guidelines. Name of the father of the cardholder – Applicable for individual cardholders. Date of birth – the cardholder’s date of birth in case of an individual or date of registration is mentioned in case of company or firm. PAN Number – It is a 10 letter alpha-numeric number and each character represents distinct information of the cardholder. First three letters – are purely alphabetical in nature and contain three letter of the alphabet from A to Z. Remaining letters – remaining characters are random. The first 4 characters are numbers while the last one is an alphabet. Signature of the individual – PAN Card also acts as a proof of the individual’s signature required for financial transactions. Photograph of the individual – PAN acts as a photo identity proof of the individual. In case of companies and firms, no photograph is present on the card. Mutual Fund – PAN is beneficial to complete e-KYC for mutual fund investments. PAN to Aadhaar linking is mandatory for e-KYC and verification to avail services and benefits from respective service providers. PAN for e-KYC is a large service requirement from many service providers and has huge benefits for the end user and government as well. Paperless- The e-KYC process is paperless enabling a service provider do manage documents easily and efficiently. Quick – PAN card holder can share information with a service provider through a secure channel within minutes, thus eliminating long waiting periods that physical documents would normally require. Secure – Information shared between user and service provider is tamper-proof digital documents sent through secured channels, thereby protecting the holder’s information. These documents cannot be forged, neither can it be used without consent of both the service provider or the PAN card holder. Authorised – Information shared by e-KYC contains authenticated data making it legal and acceptable for the parties involved in the transaction. Cost Friendly – The entire system is paperless and online eliminating physical movement of information making it a cost-effective and time-saving process.